A leading force in American journalism, a product of the liberal arts, Ida Minerva Tarbell is best known for her 19-part series “The History of the Standard Oil Company” published from November 1902 through October 1904 in McClure’s Magazine. Published as a book in 1904, Tarbell’s work helped focus attention the growing issue of monopolies in the first decade of the twentieth century and was the catalyst leading to the U.S. Supreme Court’s landmark 1911 decision to break up the Standard Oil monopoly. In 1999, the NYU Department of Journalism ranked The History of the Standard Oil Company number five in a list of the top works of journalism the twentieth century. On October 7, 2000, Tarbell was inducted into the National Women’s Hall of Fame in Seneca Falls, New York. Paula Treckel, Professor of History at Allegheny College, accepted the award on Ida Tarbell’s behalf. The U.S. 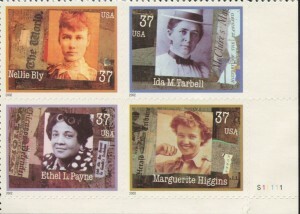 Postal Service commemorated Tarbell on September 12, 2002 in a set of Four Women in Journalism stamps that were issued in recognition of the talents of Ida Tarbell, Marguerite Higgins, Ethel Payne and Nellie Bly. The collage on the Ida M. Tarbell stamp features a black-and-white photograph of Tarbell. To the right of the photograph is a portion of the headline “The History of the Standard Oil Company,” as well as a portion of the McClure’s Magazine header, both from page 3 of the magazine’s November 1902 issue.